Atom Araullo shares his working experience with acclaimed director Mike De Leon. 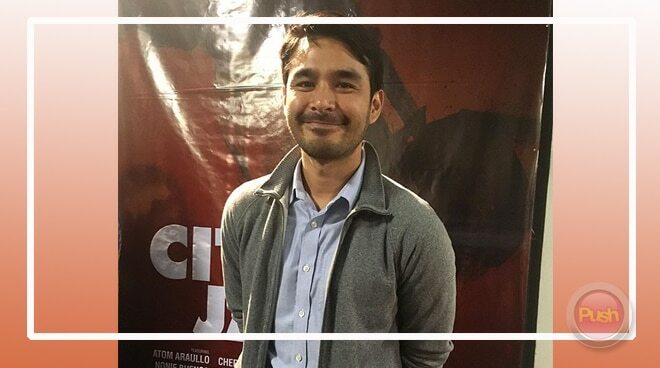 After a long wait, Atom Araullo said he is happy that his first ever film Citizen Jake will finally be shown to the public. “Kinakabahan, excited, relieved that it’s finally over. It took us almost two years to complete it and more than anything I’m really keen to share the story with Filipinos. I hope that a lot of people get to watch it. In the same way that water finds it’s own level, the film has to be created with a certain amount of time. Bilang observer, we wouldn’t want to cut corners. The film grew very organically. Ang tagal pinagkunutan ng noo ni direk Mike (De Leon). It took a lot of effort on his end. Bilib ako sa kanya at his age he found the energy to complete the film. We almost dropped it several times pero buti na lang andito na tayo ngayon,” he shared during the Citizen Jake invitational screening held last March 10 at the UP Film Institute in Quezon city. Atom admitted it didn’t take a lot of convincing for him to accept the role of reporter-turned-blogger Jake Herrera. “Ang unang sagot dahil fan ako ni direk Mike de Leon. I’ve always watched his films and I feel like there [was no way I] was going to reject this offer of being part of Citizen Jake. When we first started, it wasn’t even clear that I was going to act in it. I just wanted to be part of it in whatever capacity, bilang consultant, bilang co-scriptwriter which eventually happened. But more than that, now that everything is done, I really feel that cinema, whether we like it or not, it’s a huge influence in society and as a journalist, I can identify with that. We make stories to inform, educate, and hopefully to move people to action and cinema does exactly that. So it’s just a different way of telling a story and reaching an audience so I find it very interesting,” he explained. Headlining a film was a different kind of challenge for Atom which even made him doubt his capabilities at one point while shooting the film. “Ang hirap maging aktor, lalo na yung seryoso sa trabaho nila. At marami tayong magagaling na aktor. They make it look so easy and I found out the hard way that it takes a lot of effort to travel competently. You have to be so vulnerable, you have to be honest, and you have to kind of give part of yourself to the audience. Na-trauma nga ako eh (laughs). Ibig sabihin somewhere along the way naisip ko, ‘Kaya ko ba talaga gawin ito?’ And there were doubts, not just from my end but also from the rest of the team if I could actually pull it off. But it’s up to the audience to decide if it’s a credible performance or not,” he explained. The 35-year-old newbie actor said he hopes audiences will be able to appreciate his character apart form his real-life persona. “Honestly I just tried my best to act in a competent manner. I think at the end of the day my performance in this film would be a very minor component of the reasons why it works and the reasons why people will find it interesting and engaging. I’m surrounded by a very formidable cast. Direk Mike guided me all the way so obviously Jake is not Atom. Part of Jake is Atom but I would say it’s juts a small part of it. Sana pag napanuod nila ang pelikula hindi nila ako ma-recognize,” he said. Citizen Jake will be shown on March 13, Tuesday, at UP Cine Adarna with tickets priced at P150 each, available at the UP Film Institute Media Center located beside Plaridel hall. Gates open at 6 pm, screening at 7 pm.